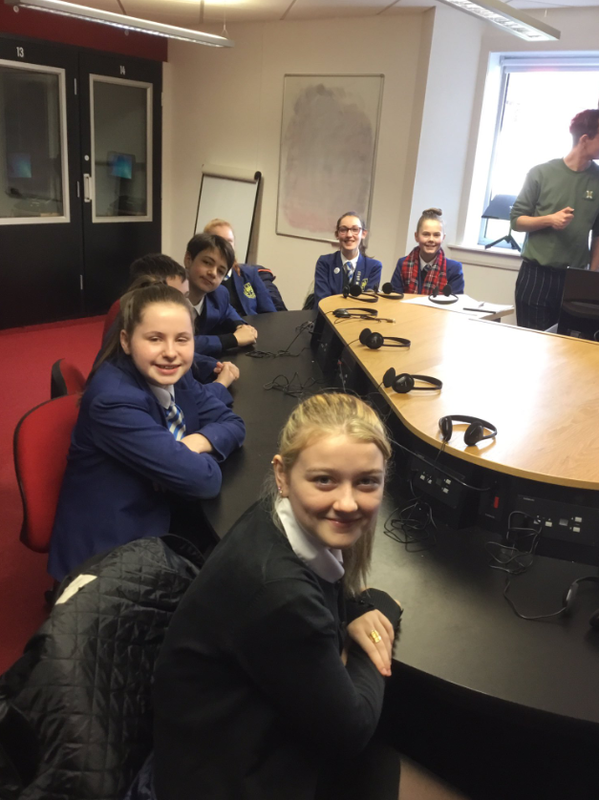 As part of this long-standing cooperation, S1 to S4 pupils visit campus several times a year and get a chance to consolidate their French and Spanish, but also to broaden their knowledge and understanding of languages and cultures. This scheme was initially set up as a collaborative project to work towards the implementation of the government’s 1+2 policy, and it’s one of the many innovative ways in which LINCS engages with local communities in order to inspire young generations of learners. The project was initiated by Mr Meikle, one of LINCS’s graduates, who is now Depute Rector at Larbert High, and it has been beneficial to both institutions: young learners with a taste for languages get a chance to further their skills by working with native speakers and talented university students, while discovering our campus, and Heriot-Watt students and Erasmus students and interns get a chance to share their culture and passion for languages, whilst gaining some valuable teaching experience. This collaboration has benefited our graduates and students further, as Larbert High has welcomed some of them as volunteers for some shadowing and classroom experience, like Mrs More. She has been accompanying the groups to her alma mater and this experience enriched her CV; she’s since secured a place on a teacher training postgraduate programme of studies. So what do pupils do when they visit LINCS? They engage in a range of activities geared both towards practice, with applied classes in French and Spanish related to their curriculum, but since LINCS is a also very global department, with expertise in multilingualism and multiculturalism, we use the in-house expertise to broaden these young linguists’ horizons. For instance, during their latest visit, S2 and S3 pupils got an insight into British Sign Language learning, thanks to two of our Honours students from the BSL degree in Interpreting, Translation and Applied Languages Studies. 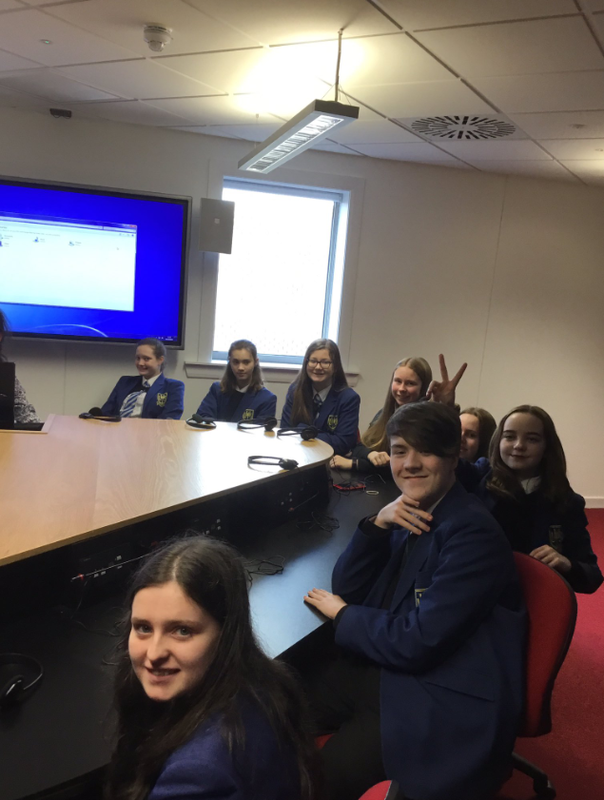 Lou and Louise explained how they came to study this language, how the learning experience is designed and the skills they developed along the way, and pupils’ curiosity was clearly peeked: they asked questions about the language, but also about the deaf community and culture. Thanks to our Erasmus + intern from Mons University, Nathanaël Stilmant, these two groups also discovered another French-speaking country, Belgium. As part of this session, very much focused on the multilingual nature of this country, pupils also had a chance to learn some Dutch and Walloon. S4 pupils, who are already thinking of exams, worked on their Spanish with two of our Honours students: Simon and Rachel devised activities around their curriculum, but also shared anecdotes about their experience as students at Heriot-Watt and as Erasmus students abroad, since the M.A. includes two semesters of study in one of our partner institutions on the continent or beyond. This helped young learners consider the importance of a global profile, at a stage when they are making important study choices and are starting to think about higher education. As for S1 pupils, after a French session with one of our enthusiastic 2nd year, Samuel, they went on an adventure on campus: armed with audio clues in French, they explored the grounds, collecting information along the way, in a bid to crack a code to work out the secret message they had been given. This cross-disciplinary and fun approach gave them a glimpse into the daily life of students as they went from one place to the next, and this discovery experience is also part of a joint bid to make young pupils think about university studies from an early age. It was also a chance for them to realise that languages and STEM subjects often complement each other well: code-breaking has historically been done by linguists as much as scientists; for instance, many of the talented code-breakers who worked in Bletchley Park during World War II were linguists, and worked alongside mathematicians to crack and decipher codes used by enemies to communicate. But more exciting opportunities lay in store: for their next visits, pupils will get a chance to visit the Confucius Institute for Business and to learn some Esperanto, to name but a few of the activities LINCS has in store for them. On Wednesday 3rd October, to celebrate International Translation Day, the Heriot-Watt Centre for Translation and Interpreting Studies in Scotland (CTISS) hosted a symposium on a topic that will dominate the translation and interpreting conversation for years to come: technology. CTISS director, Jemina Napier, and Head of French Section, Fanny Chouc, organised an event that featured three interesting and insightful presentations by Rebecca Elder, Robert Skinner and Sarah Fisher, on the place of technology in the daily life of a translator or interpreter. Rebecca Elder, a recent HWU graduate and now freelance translator, showed us how she uses technology for work purposes. She also gave us an insight into the way she works and provided some helpful tips for starting a career as a Freelance translator by tackling seven specific challenges. To the question, “Is technology a friend or foe?” Rebecca stated she does not think technology will replace translators anytime soon but new tasks such as post editing of machine translation will have to be taken into consideration. She also underlined the importance of having a CAT tool before moving on to discuss how to technology can help establish a presence on the market and overcome a lack of experience, or what is popularly referred to as “impostor syndrome”. Rebecca’s presentation was an invaluable source of information, giving precious advice, derived from her own experiences, on how to begin a career as a freelance translator. 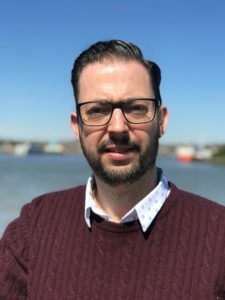 Robert Skinner, a current PHD student at HWU and professional BSL interpreter, discussed video-mediated interpreting for non-emergency calls to the police. BSL interpreters have long been at the forefront of technology, but even so, Robert revealed how interpreters and users still face a number of challenges with Video Relay Services and Video Remote Interpreting. BSL interpreters working remotely, for example, have to think about how they introduce themselves to the user. He gave us an example of an Italian interpreter who practically assumed the role of a Police officer. Interpreters also have to think about how they communicate with the police and deaf users at the same time, often forced to speak two languages simultaneously. Our final speaker, Sarah Fisher, a former HWU MSc student & professional conference interpreter, talked about conference interpreters’ perceptions of the impact of technology on their work. 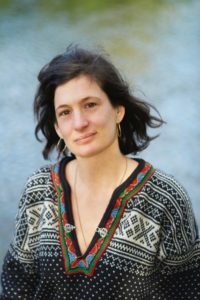 Her research focusses on the use of technology in the booth among interpreters and on the sociocultural impact technology has on the profession. Sarah has conducted numerous interviews with practicing interpreters, revealing an overall increase in the use of technology in this field. Nowadays, interpreters bring their laptops to facilitate their task, and they also make the most of social media, both as a way to build their own profiles and to stay connected to other interpreting professionals. According to her data, however, conference interpreters value these tools as back up rather than as something that will replace the traditional pen-and-paper toolkit. Most interestingly, conference interpreters seem to have a keen sense of the sociocultural aspects of technology and the negative impact it has on the profession. Sarah revealed that there is a growing sense that technology has a negative impact on the visibility of interpreting professionals, who worry that they’ll be viewed as just “a voice that could be anywhere, that could be anyone.” Perhaps this is why technology is such an important area, and one that needs to be discussed further and in broader terms, because some of the perceived challenges translators and interpreters face in this new technological age can only be overcome by viewing technology as an ally rather than an enemy. 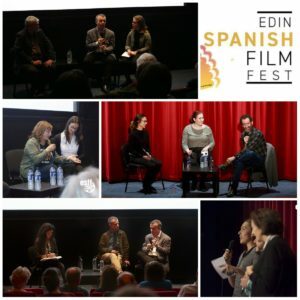 As Scotland-based Spanish film lovers are well aware, early October marks the arrival of the Edinburgh Spanish Film Festival. The Edinburgh leg of the 2018 edition of the festival took place in the Scottish capital between October 4-13, before moving on to Glasgow until October 20, and including a showing in Stirling on October 7. This cinematic event showcased some of the most interesting, exciting and thought-provoking examples of recent Spanish cinema. Highlights included Handia, shown on opening night and shot mainly in Basque, Hopelessly Devout, a hilarious comedy presented at the festival by José María Conde, head of the Spanish section in LINCS, and the gripping thriller Mist & the Maiden, based on a book by acclaimed writer Lorenzo Silva and for which LINCS lecturer Leyla Navarrete did an outstanding job as an interpreter for the Q&A session after the film. 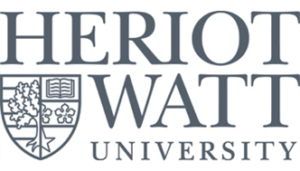 Once more, the festival was the perfect platform for further collaboration between the University of Edinburgh and Heriot-Watt University. It was also the ideal setting for LINCS volunteer interpreters (María San Juan, Marina González, Eilidh MacLachlan and Carmen Acosta), who were carefully chosen among our current and past cohort of MSc and Honours students, to show their interpreting skills in a high-profile event. At LINCS we are very proud of the key role played by our volunteer interpreters and also of our participation as major sponsors of the festival. We are already looking forward to next year’s edition! 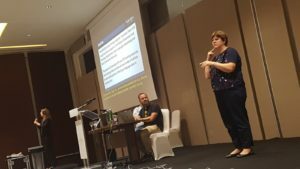 In this blogpost, Jemina Napier and Audrey Cameron provide an update on the work that has been done on the DESIGNS project (promoting access in employment for deaf people) since our last blog/vlog in May 2018.
efsli conference in Croatia in September 2018 – where the theme was “Interpreters working in employment”. The next update is due in the New Year. Below is an English translation of the update that was presented in BSL. Audrey: We just wanted to update you about some of the exciting work we have been doing on the DESIGNS project over the past 5 months. We have both been busy attending events and letting people know about the project. The report for the European Commission is almost completed and then, after it has formally been presented to them, it will be made available for people to look at. Jemina: Do you remember back in May, Audrey and I were talking about some of the things we had planned? 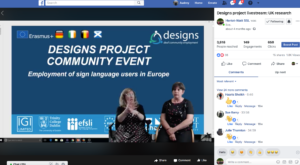 Well, one of those was a Facebook livestream event, which we did the following month, with Mette Sommer, and Emmy Kauling; Audrey and I talked about the research we are doing here as part of the DESIGNS project and the other two explained about the research they were doing which is about also about deaf people and employment. Amazingly, we got 1,800 views, with people either watching it live, or afterwards when it had been uploaded. So, if you haven’t yet seen it and you’re interested, go to Heriot Watt ‘Life in LINCS’ Facebook page and you’ll see the uploaded video there… wow, when I think about it, one thousand eight hundred views, that’s a lot! Audrey: I do think that livestreaming is a good way of connecting with the Deaf community and keeping people informed. Whereas in the past, we would need a room and invite people along, this way we can let everybody throughout the whole of the UK know what is going on all at the same time. The other advantage with livestreaming are the questions that people post, which we were then able to respond live and in real time. Jemina: That’s right, people typed in their comments and they would then pop up – we relayed their questions to everyone in BSL and were able to respond; it is really interactive. Audrey: What was also good about it was that we had our PowerPoint slides displayed behind us, so that people watching could see the information we were referring to, so hopefully we will line up a few more of those in the coming months. 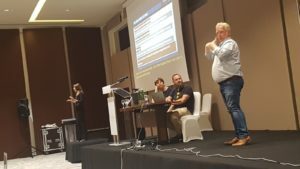 After the live stream event I went to Croatia for the Efsli (the European Forum of Sign Language Interpreters) conference in Dubrovnik – where the theme was ‘Interpreters working in Employment’ which is obviously the focus of the DESIGNS project. I went to represent the team here in the UK and my colleagues from both Germany and Ireland were also there, along with 300 delegates, most of whom were interpreters from all over Europe. It was fascinating – at the very start of the conference we all took our seats and then the question was asked ‘Who here is from England?’ and they would stand up and everyone would wave. There were loads of different countries represented, I’d say about 30, not just in Europe but from around the world, from Australia, America, Canada, Mexico… it was great for us being able to present the data from this project to so many people; for some it was probably something to bear in mind if they’re looking to improve things in back in their own countries; for others it might have been a reminder that they’d had similar experiences in the past. Audrey: … yes, along with Christian Rathmann. We had about half an hour to talk about the project. There was one presentation by two designated interpreters from Austria working with a deaf pharmacist. They talked about what it was like – that was good. What else? This year was the first time they had interpreters from Russia at the conference – there was a booth at the back of the room with an interpreter plugged in with a head mic working into Russian, so that was something a bit different. The presentation from Russia was amazing. They showed a film of all these factories in Russia which have many deaf people working in them and who then all live nearby. There were also photos and apparently, the ratio of interpreters to deaf people is one in fifty. The conference was good and over the two days, there were many references made to deaf employment. 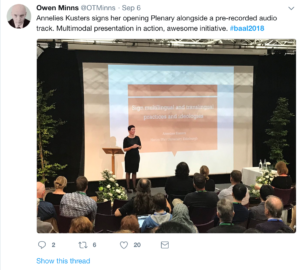 Jemina: After the conference and all those presentations, I recently delivered a training webinar for ASLI, the interpreting association here in the UK. I gave a presentation and facilitated a discussion online and I think we had about 40 participants watching. I explained to them all about the DESIGNS project and picked out some themes from a Europe-wide perspective. Then we focussed in on the UK and I explained how we’d interviewed deaf people, employers and interpreters, so I was talking to them about BSL interpreters and what we’d found here in the UK. It was interesting – there were lots of questions; they were looking for any tips we might have that could help improve things, because they are all too aware of the barriers. Whilst the government makes money available via ATW that does not mean that interpreters are automatically provided and everything goes smoothly, so it was interesting to have that discussion with them, and the feedback from the session was good as well. Jemina: … Yes, they provide a platform to support employers to recruit disabled people across the board; they have really supported us a lot with this project, helping us to make contact with employers. Jemina: … that will act as a pilot. Then we will be doing training for interpreters here in Scotland in partnership with Deaf Action in Edinburgh, where they have an employment service and an interpreting service. The training will be more practical, as opposed to the Asli webinar, which had more of a presentational style, sharing the data and the findings and etc. This will be much more ‘hands on’ for working interpreters. We are hoping to have about 20 interpreters at the session in December. Audrey: We will be taking all the data we have gathered from the interviews we have conducted and sharing that with employers and interpreters. Our next whole team project meeting is in Antwerp in Belgium in December where we will be discussing next steps. Jemina: Plus as a project team we’ll delivering training in partnership with efsli for interpreters from all over Europe and those who train interpreters; that will build on what we’ve done so far and we’ll do that while we’re there in Antwerp. Then a week later, we will both be delivering training here in the UK. Audrey: I am looking forward to it. The training is important if we are to start removing the barriers that deaf people face trying to find employment and it is why we are setting that up for employers and interpreters. The training for deaf people will be starting next year, isn’t that right? Jemina: Yes, exciting times, so keep an eye out for further updates! *Thanks to Ramon Woolfe for sharing his photos taken at the efsli event. What do people think when they see a signing person on stage, and hear a simultaneous interpretation? I wasn’t using a pre-recorded audio-file from which I was interpreting myself. I am a deaf scholar. I presented in British Sign Language and was interpreted into spoken English by Jemina Napier. This is the typical practice for deaf academics presenting at conferences. However, rather than just waving it away as the umpteenth ignorant comment about deaf people, another funny anecdote to share with my friends, this also made me think. I am in a pivotal moment in my academic career in that I’m becoming more visible. Did it even occur to the Tweeter that I was deaf, and that me signing my presentation in British Sign Language was not an attempt at being innovative but simply the best option at hand (sic) for me? In other words: why not assume immediately that this signing person on stage in a mainstream conference is most probably deaf? Do people not think that deaf people can be academics who can get invited as keynote presenters in this kind of conferences? Example two. During one of the breaks at the same BAAL conference, another scholar from another British university approached me. He said he had seen me on the screen: the hall where the keynote happened was full and he was watching the livestream in another room. Apparently he initially thought I was speaking and signing at the same time, and was puzzled about my Australian accent. Only later, he realised that I was working with an interpreter (and if I would have an accent in English, a language I do write but not speak, it would certainly not sound Australian!). At that conference, I was interpreted into English by Christopher Stone. A simultaneous interpretation is not a simultaneous presentation1. Example four. I taught in a summer school in Denmark a few years ago. I was teaching in International Sign and two interpreters were interpreting into spoken English. Several students thought that the interpreters were the teachers, and that I was the interpreter. And this was on (already) day three of the five day summer school. Go figure. 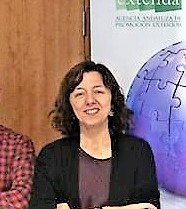 LINCS and CTISS are delighted to welcome Dr Elisa Calvo, Senior Lecturer at the Universidad Pablo de Olavide in Seville (Spain) as visiting scholar over the summer. 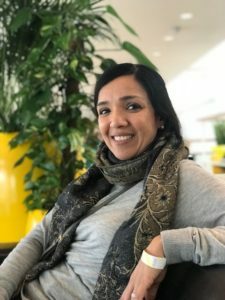 Dr Calvo did her PhD on Translator Training and Curriculum and has since published a number of articles in related fields such as professional translation processes, translator training approaches, and public service interpreting and translation. As part of her cooperation with Justino Cerezo, who specialises in clinical psychology, Dr Calvo has also carried out applied research on stress management for interpreting. This key professional skill, very relevant in particular to the practice of simultaneous interpreting, will be the subject of a workshop run by Dr Calvo on Thursday morning for the benefit of Heriot-Watt University students. The Department of Languages & Intercultural Studies recently hosted the 2018 AGM of CIUTI (Conférence internationale permanente d’instituts universitaires de traducteurs et interprètes), the old­est and most pres­ti­gious inter­na­tional asso­ci­a­tion of uni­ver­sity insti­tutes with trans­la­tion and inter­pre­ta­tion pro­grammes in the world. Delegates attended from 49 member institutions and interpreting was provided in English, French and German. The AGM was followed by the first ever CIUTI academic conference which was centred on the theme of Translation and interpreting in an era of demographic and technological change. There were a total of 30 papers on the programme, as well as panels and a workshop. All were very well received, with the President of FIT, the International Federation of Translators, describing Heriot-Watt as a “true centre of excellence for training translators and interpreters for the future”. The CIUTI event coincided with a visit from the Head of the Directorate General for Interpretation (SCIC) at the European Commission, Mrs Florika Fink-Hooijer, and Ms Cathy Pearson, also from SCIC. They met with staff members in LINCS and toured the excellent interpreting facilities in the Henry Prais Building. 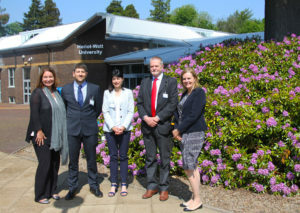 Discussions focused on possibilities for enhanced cooperation between Heriot-Watt and the European Commission; one strand of this will be Pedagogical Assistance where Cathy Pearson will return to Heriot-Watt in September to deliver interpreting classes to the new cohort of MSc interpreting students. Between 28 and 31 May 2018 the Department of Languages & Intercultural Studies (LINCS) is hosting the 2018 General Assembly and Conference of CIUTI, the Conférence internationale permanente d’instituts universitaires de traducteurs et interprètes, the old­est and most pres­ti­gious inter­na­tional asso­ci­a­tion of uni­ver­sity insti­tutes with trans­la­tion and inter­pre­ta­tion pro­grammes in the world. LINCS is a long-standing member of CIUTI and one of only three UK members. The theme of the Conference is Translation and interpreting in an era of demographic and technological change. In addition to CIUTI delegates from around the world, LINCS will also be hosting a visit by Mrs Florika Fink-Hooijer, the Head of the Directorate General for Interpretation at the European Commission, who is coming to speak to colleagues involved with the delivery of conference interpreting programmes and to view the excellent interpreting facilities available to LINCS students. 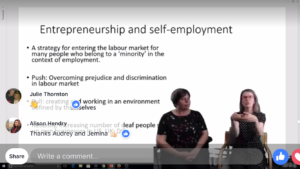 In this blogpost Audrey Cameron and Jemina Napier provide an update on the work that’s been done on the DESIGNS Project (promoting access in employment for deaf people) since our last blog/vlog post in December 2017. Interviews with interpreters working in employment settings and employers have now been completed and analysis of the data has begun. We will be presenting some of the early findings at the next DESIGNS community information event in Berlin in June. On the 14th June, from 6:30pm, we’ll be live streaming another information sharing event via Facebook with presentations from Audrey Cameron, Jemina Napier and PhD students Emmy Kauling and Mette Sommer. We are grateful to Vercida and to members of the DESIGNS project advisory group for helping us identify employers willing to participate in the research and our thanks also go to those employers who agreed to be interviewed about their experiences of working with deaf sign language users. We would also like to extend our gratitude to all those who have given up their time to contribute to the project. The DESIGNS project runs until June 2019 – the next update is due after the summer. Below is a transcript of the update in BSL. Jemina: We’re here today to give you a bit of an update on the work the two of us have been doing on the DESIGNS Project since December – was it December? Jemina: … so we want to tell you what we’ve been doing over the past 4…? Audrey: Well, the time has really flown by since it all started over 6 months ago. So let me update you on a few things. As mentioned in a previous blogpost, we’ve been interviewing people from three different groups – deaf people, interpreters and employers. Well that’s now been done and we’ve collected some amazing data – it’s good isn’t it, Jemina? Jemina: Yes – there’s a lot of it! Audrey: The next thing is to do the analysis and start identifying the key themes – whether they’re the same amongst all three groups, what the difficulties or positives have been; what the differences might be, so that’s what we’re working on at the moment. Jemina: We will be giving you more information about what we’ve found as we go on and at the end of this Vlog we’ll be telling you about one way you can find out more about those findings! We want to thank both our Advisory Group and Vercida for helping us to identify employers who were willing to be interviewed for the project – without them it would have been difficult for us to find them and ask about their experiences, so again thanks to them. Jemina: Yes… we’ve also had an Advisory Group meeting, do you want to talk about that? Audrey: Last January we had a meeting with, was it 6 Members of the advisory group? It felt a bit strange, we had the meeting online so they all appeared in boxes on the screen and we were signing to one another via Skype, but it worked well and we have another meeting like that in June. The Advisory Group members are from all over the UK, which why we have to use Skype, but like I say, it was good meeting. Jemina: The Advisory Group members all have experience of working with deaf people in employment or working in an advisory capacity with disabled people in employment and we specifically invited them on to the group to help us get a UK wide perspective. Audrey: Yes and that’s been really good. Jemina: As part of this project we arrange regular Community Information Events to let people know what’s happening in the project and to explain what’s involved. That’s really important, especially for the Deaf Community but anyone who’s interested, is welcome to come along. So far last year we had two of these – the very first one was in Dublin; the second was here in Edinburgh at Heriot Watt University, that was June last year, and then last January we had one in Bruges in Belgium. The fourth will be in Berlin when the whole project team will come together and we’ll have another community information event which usually includes presentations about what’s going on in the project plus a number of other things. You can still see last year’s event in Edinburgh – it was live streamed and recorded, so if you want to go back you can take a look at it. We also did something in Edinburgh at Deaf Action and thank you to them for hosting that. We had staff there from HW and PhD students who gave presentations about their research topics. Our fourth year students got an opportunity to practise their interpreting skills – they’re in their final year and nearly at the end of the course, so they got in some practise – Audrey, you gave a presentation about the DESIGNS Project. Audrey: It was good – members of the deaf community were asking questions and will be keen to know more once we’ve finished the project – so that’s exciting. Jemina: So what’s the plan for the next few months? Audrey: Next it’s Liverpool for the Deaf Business Academy awards event where I’ve been invited to deliver a presentation about this project and as part that there’s an award ceremony for the best businesses – I’m looking forward to that, so that’s Liverpool in June. Then in September there’s the EFSLI (European Forum of Sign Language Interpreters) conference and I’ll be presenting along with our other partners in the project from Germany and Ireland, so that’ll be good. 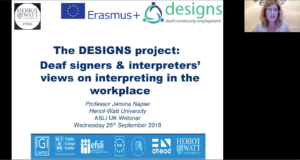 We’re also doing an ASLI webinar where Jemina will be presenting online to interpreters – that’s in September and we’ll let you know more about that nearer the time. Jemina: Oh, and one exciting thing to mention that we’ve got planned, is for this June on the 14th, we’ll be having a live streamed Community Information Event. It’ll be here but we’ve decided, rather than have people come to us, we’ll live stream it so that’ll give people from around the UK more of an opportunity to see it. It’s on the 14th June at 6:30pm in the evening. There’s already a Facebook Event/invitation page so you can click on that to let us know if you want to join in. We’ll be live streaming via Facebook with four presenters, the two of us will be revealing some of the findings from the DESIGNS Project from the interviews with interpreters, deaf people and employers and what they said the main themes were, so we’ll be going in to more depth about the findings. Plus we have two other people – one is a PhD student, Emmy Kauling – her PhD is linked to deaf professionals working with interpreters, which is a perfect fit for the DESIGNS Project. 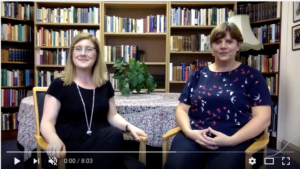 The other is a PhD student, Mette Sommer who is deaf and she’s doing research into deaf people who set up their own businesses, how they felt about it, what their experiences have been like and what motivated them to go it alone? And again that’s a perfect fit with the DESIGNS Project, which is why we asked her to give a presentation. So the four of us will be presenting for about 15 minutes each and then you’ll have an opportunity to ask questions via Twitter, or you can watch via FB and the send in comments/questions and we’ll both respond so I hope you’ll join us and be watching on June 14th. Audrey: We do want your feedback on the 14th – what you think of the findings; also maybe you can add something extra from your own experience that we could explore further with you. Jemina: This project runs up until June of next year 2019 which means as we go on there will be further updates like this one, letting you know what’s happening. Plus as part of the project there’s an expectation that we’ll produce more training resources for interpreters, deaf people and employers which means there will be more happening right through until the June when we finish. We want to say a huge thanks to the Advisory Group and Vercida and others who helped us find people to participate in this research project and also a big thanks to everyone who agreed to be interviewed either as part of a group, or one to one – we’ve been so touched by the time they’ve taken to tell about their experiences – it’s been really valuable and much appreciated, so thank you to you all! Audrey: I’m sure this will help us to make big changes to employment for deaf people – fingers crossed! 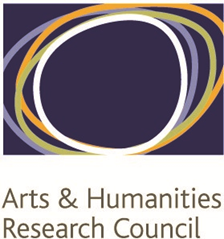 Using an innovative approach to re-interpret Deaf Studies and Interpreting research through art, 3 Deaf sign language using artists have been commissioned through Arts & Humanities Research Council (AHRC) Follow-on Funding to ‘translate’ the findings of the Translating the Deaf Self project that was initially funded through an AHRC Research Innovation Grant. The original project investigated deaf sign language users’ experiences of being known through translation the representation of deaf people through sign language interpreters and the potential impact on well being. This project explores the findings from that project through artistic exploration and transformation in the visual arts as a means of engaging more deaf people and communities with these ideas. This interdisciplinary project is being led jointly by a deaf-hearing research team from the Social Research with Deaf People group in the School of Health Sciences at the University of Manchester and the Centre for Translation & Interpreting Studies in the Department of Languages & Intercultural Studies at Heriot-Watt University. 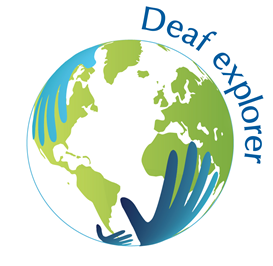 The team are working collaboratively with Deaf Explorer – an artist agency supporting Deaf creatives – to support artists-in-residence in Deaf community organisations, including Deaf Action in Edinburgh, DeafPLUS in London, Manchester Deaf Centre and the Royal Association of the Deaf in Romford. Three professional artists, and one artist intern, will spend a period of time in each organisation where they will be given the time, space and resources to delve into the issues reported in the preceding Translating the Deaf Self project with local Deaf people and to inform their artistic inspirations. Other arts based workshops will happen in further locations. This is a community-participatory project that not only involves local deaf communities but also offers the opportunity for deaf artist capacity building through the recruitment of a new deaf artist to shadow one of the professional artists as an intern. An exhibition of the artwork will take place in September 2018, and community responses to the art will be gathered in order to further explore the extended concept of Translated Deaf Selves. Christopher Sacre will be based at Deaf Action. His work involves exploring the flow, boundaries and the shape of humanity and human populations, the inclusion and exclusion and how some humans move through the world differently to the rest. Rubbena Aurangzeb-Tariq will be based at Deaf Plus and her installations and paintings explore how we collect our feelings and thoughts within ourselves and how we learn to contain them within our own personal space and cultural boundaries. Louise Stern will be based at the Royal Association of the Deaf and has produced visual arts, films, and literature that work around ideas of language, communication and isolation. 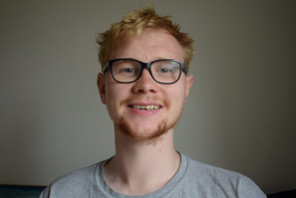 Ruaridh Lever-Hogg recently graduated with a Masters in Fine Art from the University of Dundee and will be involved as an intern.. In his artwork he explores emotional responses to place, events, form or object. Search the hashtag #ArtviaTDS on all social media platforms (Instagram, Twitter and Facebook.) The artists and research team will be using this hashtag to post about this project and its progression! 30 Aug 2016 [LINCS] The Translating the Deaf Self project: Where are we now? 13 Jan 2017 [LINCS] The Translating the Deaf Self project: Wrapping up and what’s next?